While some call it Red Palace, others call it Red Fort. The locals call it Qasr Al Ahmar. But the very name reminds us of our very own Red Fort at Delhi. So one weekend we decided to check it out ourselves. We read it that it’s at the outskirts of the city, somewhere in Jahra. It was our first visit to the area. A long drive from our place, but we enjoyed it. First time we started it was late afternoon…we were new to the place and it took us some time finding out the Red Fort/Palace. It was dark by the time we reached. Also it was Ramadan time and we found the doors closed, so we left after taking some pictures from outside. We drove again another day in the morning and enjoyed our drive and the visit. Qasr Al Ahmar is an old mud fortress which today stands as a source of Kuwaiti pride and patriotism. From the name it is obvious that this is a red structure. Located near the highway, the Qasr al Ahmar or Red Palace lies about 32 kilometres west of Kuwait City. It was built around 1895, under orders from Amir Sheikh Mubarak Al-Sabah, better known today as Mubarak Al-Kabir. Folklore has it that it's red color comes from the bloodshed by those who fought and died in the Battle for Jahra in 1920. 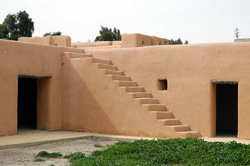 The building, which was used primarily as a strategically located fort to protect the agricultural village of Jahra from invasion, occupies 60,000 plus square kilometers of land. The Red Palace boasts four towers - one on each corner of the rectangular structure. It encompasses 33 rooms and six courtyards including a large main courtyard which contains a water well which was dug during the siege of Jahra (Battle of Jahra, 1920). There are three large wooden gates, the longest of which is located to the east, while a smaller gate on the north side connects to a courtyard which was said to have been 'the women's courtyard'. Master builders known as Estad worked on the palaces construction and many are remembered today by name. Estad Suleiman Al-Salem and Muhamed Al-Ali Al-Said are two such master builders who led the many men who worked to construct the fortress. Estad Ibrahim Al-Maana used mud mixed with local desert shrubs to form the bricks which were used to build the fort's four towers. On October 10, 1920, Jahra was attacked by an Ikhwan army which was led by Faisal Al-Daweesh of Saudi Arabia. The Ikhwan army of around 400 men took over Jahra, besieging the fort. The Kuwaiti fighters numbering around 2,000, were led by the Amir Sheikh Salem Al-Mubarak Al-Sabah, son of fort builder Mubarak the Great. While the Amir Sheikh Salem was in Jahra, he left Sheikh Ahmad Al-Jaber (who later became Amir himself and is the father of the current Amir, HH Sheikh Sabah Al-Ahmad Al-Sabah) in charge of Kuwait proper. On October 11, Sheikh Ahmad sent 600 armed fighters on boats to help those besieged at the Red Palace. Not long after the battle, Al-Daweesh and his men left Jahra. Legends have it that its red color came from the blood of those martyred in the battle. Today the Qasr has been restored and is a museum displaying various artifacts from Kuwait's history. Al Jahra is one the six governorates of Kuwait. It is located to the northwest of the other governorates and houses the city of Jahra among others. It includes the island of Bubiyan and is by far the largest governorate in Kuwait. It also contains most of Kuwait’s arable land. The Red Palace is the most important historical landmark here and a center for exhibitions and festivals.